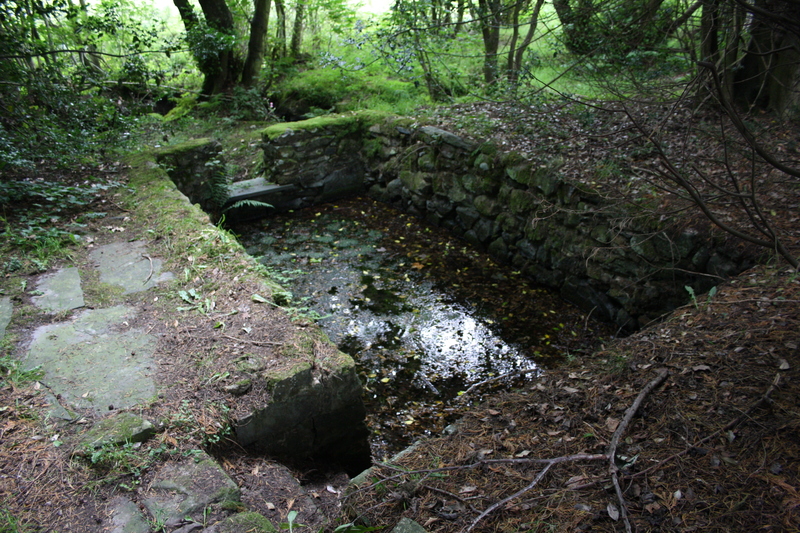 Ffynnon Sara (Sarah’s Well) is near Derwen, Denbighshire. Some writers in the past have assumed that Sara is a derivation of St Saeran. who founded a monastery at Llanynys in the 6th century which is some 8 miles from this well, This is, however, a recent assumption and there is no reason why he should have become associated with the well. 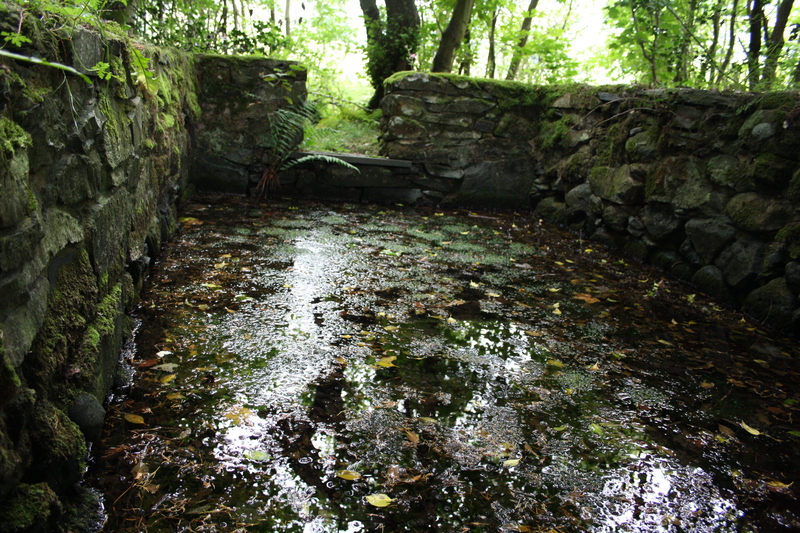 In the 17th century the well was known as Ffynnon Pyllau Perl (Pearl Ponds), linked probably with a house a hundred yards away to the south west with the same name Pyllau Pearl. 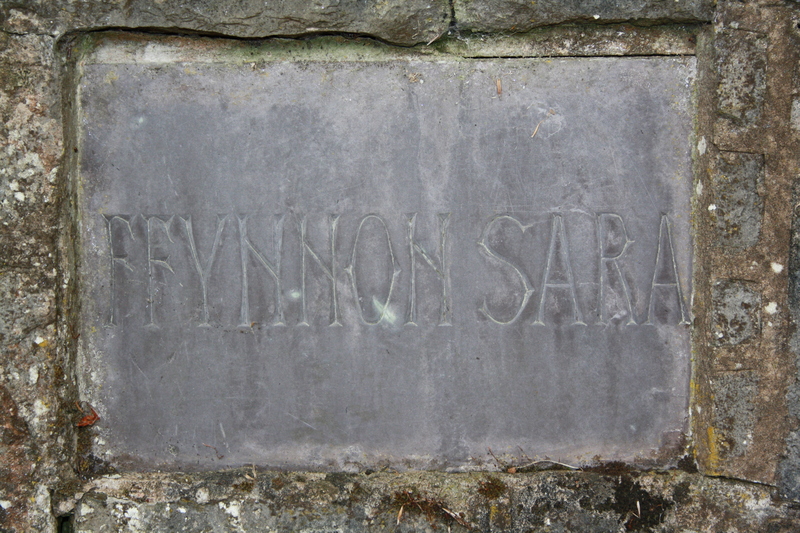 The present name, Ffynnon Sara (or Sarah) , is now commonly assumed to be derived from that of a woman who lived in a cottage beside the well and tended it. Those cured at the well left their sticks and crutches at the cottage as a sign of thanksgiving. It is believed that the cottage burned down in the mid nineteenth century, the Report of the Royal Commission Inspector from 1908 implies that the site of the cottage was still visible, though this is not now the case, it possibly vanished during the 1970s landscaping.. The name Ffynnon Sarah has been used since at least the start of the 19th century, it appears, with reference to its curative powers, in Nicholas Carlisle’s 1811 Topographical Dictionary of Wales in the entry for Derwen. 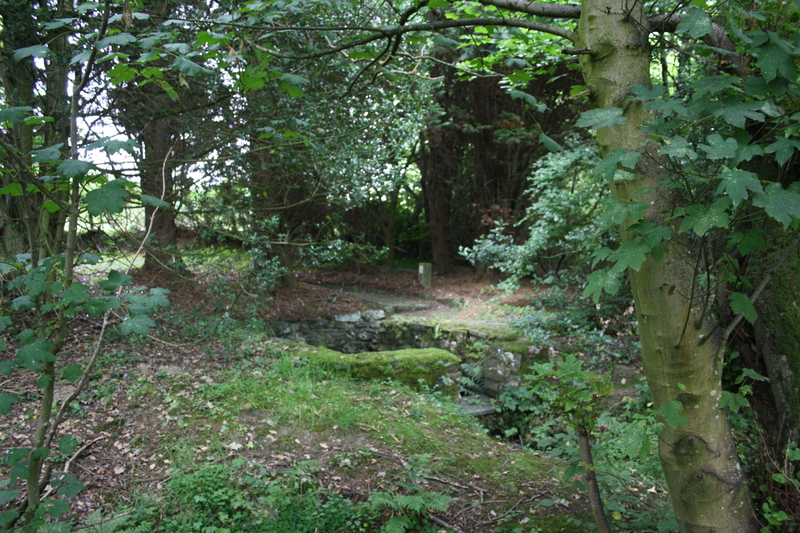 The well was repaired and landscaped in the 1970s by the then vicar of Derwen, so it now stands in its own grounds, accessed by a cobbled path from a gate at the roadside. 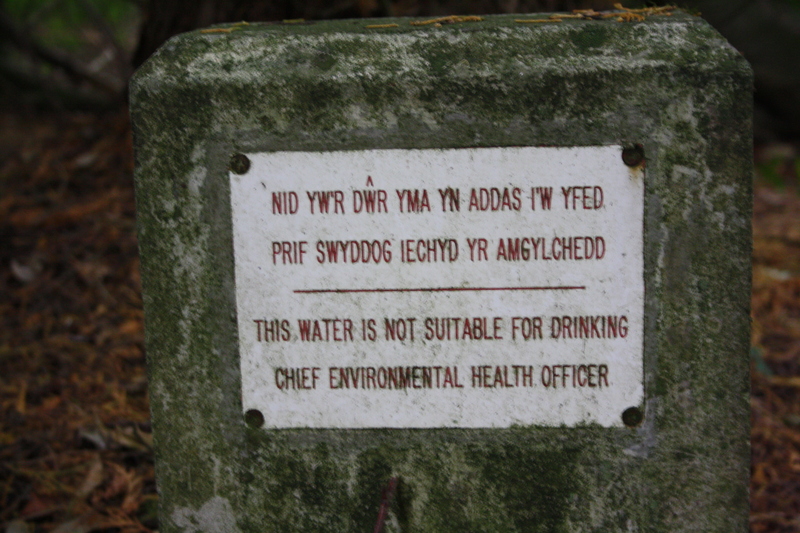 To find the well from Ruthin, take the B5105 towards Cerrigydrudion. At Clawdd Newydd turn left onto a minor road signposted Melin-y-Wig. This is the Pilgrim Track. After the first left turn signed to Derwen continue about half a mile. The well is on the right. Ffynnon Sara lies on the route of what was the Pilgrim’s Track which linked St Winefride’s shrine at Holywell with St Davids. It was one of the most important pilgrim routes across Wales in the medieval period, and was identified as such on route maps at least until the seventeenth century. The well as it stands today is a stone lined basin with stone floor. Three steps lead down into the water. It measures about 10feet by 6feet. At the times I have been there the water has been about 6 inches deep. Water flows out of the basin down into a stream that flows past the site. The well was traditionally believed to cure cancer and rheumatism. Visitors would frequently drop pins into the well as an offering before entering the water. There is a local story of a young woman whose hands were affected by eczema. She was about to get married and, worried she wouldn’t be able to wear her wedding ring, was advised to wash her hands in the well’s water. Legend has it she was completely cured in time for her wedding. It’s most unlikely that this well has anything to do with St Saeran. This is a recent assumption. In the 17th century it was known as Ffynnon Pyllau Perl. thanks, I have updated the text in response to this comment.